The Sinai Peninsula or Sinai (Arabic: سيناء Sīnā), is a triangular peninsula in Egypt. It is about 60,000 km2 (23,000 sq mi) in area. It is found between the Mediterranean Sea to the north, and the Red Sea to the south. It is the only part of Egyptian territory located in Asia. 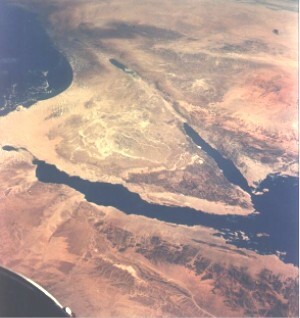 This is because the Sinai is known as a land bridge between two continents. There are approximately 500,000 people living there. Egyptians refer the Sinai as the "Land of Fayrouz", based on the Ancient Egyptian "Dumafkat". There has been several battles in the region. The Sinai has been under the rule by Egyptian governments, including the Ayyubids, the Mamluks, the Muhammad Ali Dynasty, and the modern Egyptian repulic. It was also controlled by the Ottoman Empire, and the United Kingdom from 1882 to 1956. Israel invaded and took over Sinai during the Suez Crisis (known in Egypt as the Tripartite Aggression) of 1956 and during the Six Day War of 1967. On October 6, 1971, Egypt began the October War to allow the Sinai to be a free nation. In 1982, after the Israel-Egypt Peace Treaty of 1979, Israel left Sinai. Since Israel's departure, the region became a tourist destination. This was because of its natural setting, their coral reefs, and biblical history. Mount Sinai is a sacred place in Abrahamic religion. Sinai Peninsula Facts for Kids. Kiddle Encyclopedia.